Over the last five years, Skip La Cour has helped thousands of forum posters reach their potential and smash through plateaus. Here are the highlights of this natural bodybuilder's forum thread! Skip La Cour is a six-time national drug-free champion bodybuilder who has won 15 bodybuilding competitions in his career. His 10 books, eight top-selling DVDs and five audio seminar courses have helped thousands of people at all training levels reach their goals. Way back in May of 2008, Bodybuilding.com invited me to create my own thread on its forum. The hope was that I could provide answers to readers' most pressing bodybuilding questions. I don't think any of us had any idea then what a phenomenon it would become! Five years, 8,000 posts, and a half-million views later, The Skip La Cour - Mass Machine Bodybuilding thread contains much more than questions and answers. There are more than 200 instructional and motivational videos and even weekly podcasts produced specifically for the thread. Readers post videos of their own workouts, and I often provide them with individualized coaching and critiques. Over that time, the thread has become an integral part of how I interact with the bodybuilding community. When I created the six-month Mass Machine Nutrition Bulking and Cutting Program Challenge in 2012, the Bodybuilding.com forum became the contest's front lines, with more than 100 videos and 24 conference calls still available on an offshoot thread I'm confident it will also play a central role in my new challenge, 49 days to Supreme Confidence. To commemorate reaching 500,000 views, I'm offering up my 10 most valuable tips from the thread. Here they are, in no particular order. Some people place far too much importance on the number they see on the scale. What they forget is that it's not about gaining weight; it's about gaining high-quality lean muscle weight. The number on the scale changes from day to day and even from hour to hour. Yes, you should weigh in regularly, but not obsessively. The mirror is a far better evaluator for measuring success. Muscle soreness is a direct result of small breaks in the muscle fibers during your training session, but soreness is an unreliable measurement tool. Yes, it probably means that your workout has reached a higher level, but keep in mind that if you worked out for the first time in a year, you'd be sore, regardless of your workout's effectiveness. Also, effective and consistent training often produce less soreness as you progress. That doesn't mean your workouts are losing effectiveness. It simply means you're getting stronger. No matter how good your program is, it won't get you results if you don't perform it confidently, enthusiastically, and above all, consistently. Results are the only thing that matters. If what you do works for you right now and you're committed to it, then keep doing it. As you gain more experience, you can build up to whatever is the "optimal" program. Remember, it's important to stick with the fundamentals and take them to higher and higher levels if you want to succeed. The videos, podcasts, and posts on the thread delve much deeper into this topic. 4 / Less is More—Really! Shorter sessions with fewer exercises, sets, and reps are the best way to build mass in the shortest time. I call this "Mass Machine Training." I learned this in my own career. When a person is forced to up their game without using more reps, sets or exercises, they find out what they are truly capable of in the gym. It wasn't until I made myself stick to a 4-6 rep range with heavier weight and fewer exercises in a shorter period of time that I started to get incredible results. I offer 13 free routines just like this for you on my website. Mass Machine Training is awesome because it builds mental and emotional strength along with promoting physical strength and muscle gains. I make money selling supplements, but I'm telling you that they are not a replacement for good training, healthy eating, or mental focus. Mass Machine Nutrition makes outstanding and highly-effective supplements, but they're simply an important addition to all of those other things, and they only benefit you once you have your goals and system in place. How's that for giving it to you straight? Skip La Cour's Whey Protein Mixes Easily & Tastes Great! An Excellent Way Of Delivering Muscle Building Aminos! Find Mass Machine Nutrition products on our store. The foundation of all good training programs is their intensity, regardless of whether they're long or short, split or whole-body programs. All training should be a sprint, not a marathon. The more you "sprint," the more effective your training will be. Training in a marathon-like manner nets you less progress in a longer period of time. Mass Machine Training forces you to step up and use your physical, mental, and emotional abilities to their fullest. You'll be surprised by just how much your performance in the gym will improve when you are locked in. Some bodybuilders require tough love to understand this, and because I know firsthand what it takes to get results, my coaching often involves this tough love. I promise, it is well worth it. I firmly believe that shorter, more intense workouts are the key to achieving phenomenal results in a shorter period of time. I don't think that any workout should last more than an hour-if that. A lot of people think that my 25 years of experience allows me to get results from a short workout, but they're looking at it from the wrong perspective. It's not my experience that allows me to shorten my time in the gym without sacrificing effectiveness. It's your lack of experience that makes you feel you must stay in the gym longer. This is because you lack confidence in your ability to effectively train. The key is to force yourself to be just as effective in less time. That's when you hit the level of intensity you need to get results from a short workout. Having the right mindset is the key to effective training. If you phone it in, you might as well go home. Unfortunately, most guys believe they are "working hard" in the gym even when that's not the case. That's OK. It's why I make myself available to you on the message board. It's my job as your coach to help you discover what you are capable of achieving. I take that role seriously. You have to be completely focused on every rep, completely tuned in to every muscle. You also have to believe in yourself and what you do. You can engage all the muscle fibers you want, but you won't see dramatic results unless you engage your mind first. If you're not mentally ready when you walk into the gym, take five minutes to get ready or you'll waste your time and energy. 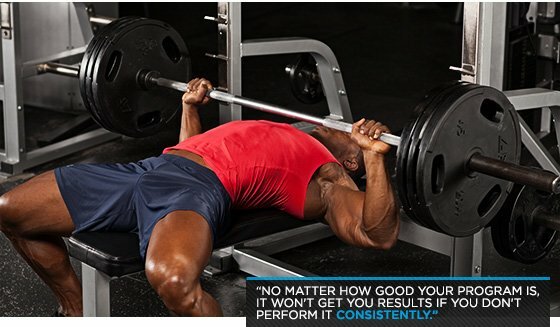 There's a huge trend toward on taking the shortest rest between sets, but I say you may need to make them longer. You should rest long enough to get close to 100 percent of your strength back, but not so long that you lose your concentration and focus. In heavy weight training, with the goal of absolute muscle failure, you need to get most of your strength back before moving on to the next set. This is because you have to train as heavily as you can to build real muscle in the most effective and efficient manner. You must learn to train this way to build the most amount of muscle in the shortest period of time. A lot of guys feel that shorter rest periods help them lose fat faster, but that's why we diet and perform cardio. When you lift, your goal is to build muscle, not burn fat. Good training isn't just what you do with your body; it's also what you feed your body. You've all seen guys who work out like mad but their bodies just don't show the results you'd expect. This is usually because they lack the nutrients to get those results. 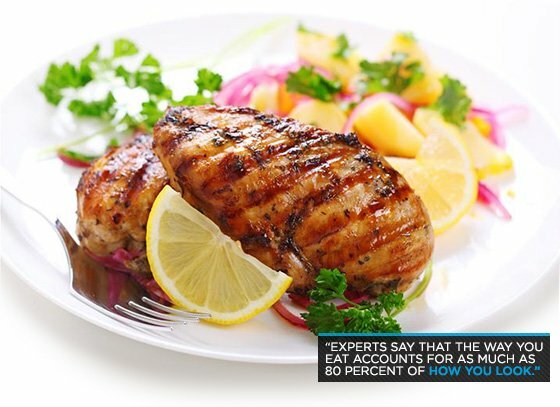 Experts say that the way you eat accounts for as much as 80 percent of how you look. My experience bears this out, to the extent that if I had to choose between working out and good nutrition, I would take good nutrition. Learn the important basics of good nutrition and follow them consistently! This is why I talk about nutrition so often on the thread. It's a huge part of the bodybuilding world. These are 10 insights to take to heart, but there are many more valuable tips I could discuss. Well, I do-on the thread! The thread includes a wealth of information you don't want to miss. When you visit the thread on a continual basis, you'll also get to know other passionate BodySpace members working hard to improve their bodies and minds, just like you! It has been an honor to work with all of you and watch your progress. If you're not a member, make sure you subscribe to this thread so you'll be notified by email every time new questions, answers, videos, podcasts, and more are posted. Here's to the next 8,000 posts!